Sometimes, even if you’re surrounded by Michelin three-star restaurants, you just want a good taco. And, this being the Napa Valley, we have everything from authentic, traditional Mexican food to slightly chi-chi’d-up interpretations. Here’s a list of some local favorites — except where noted, all venues are located in Napa. C Casa at Oxbow Public Market. 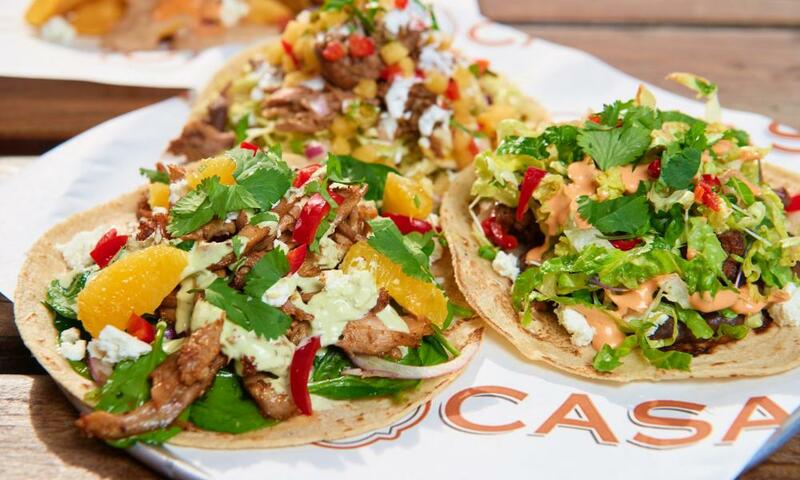 With a “Taco Lounge” in a bustling food court, this counter-style restaurant serves eco-friendly & innovative gourmet Mexican street food & small plates, including tacos with ground buffalo, spiced lamb, and grilled garlic citrus prawns. Oxbow Public Market, 644 First Street. Heritage Eats. Created in the model of Chipotle, this world-food spot allows you to customize your own wraps and tacos with an international flair – Vietnamese, Jamaican, American, Thai, Indian, Middle Eastern, and, of course, Mexican. Also available as salads or bowls. 3824 Bel Aire Plaza. Villa Corona. This favorite stand-by offers all the traditional favorites in a hard or soft taco shell, and has a great vibe and patio dining. 3614 Bel Aire Plaza, Napa or 1138 Main Street, St. Helena. Tacos Esperanza. Fresh, fast, and inexpensive, this taco truck attracts a lot of loyal locals, serving such traditional fare as steak, carne asada, and el pastor tacos. The crispy fish is a favorite. 1551 Soscol Avenue. Tacos La Playita. This unpretentious, authentic restaurant features the usual meat fillings, as well as beef tongue, pork stomach and beef cheeks. Not for the timid! 2580 Jefferson Street. La Gitana Taco Truck. The La Gitana truck is parked at 1102 Tubbs Lane in Calistoga from 9 am to 4 pm Monday through Friday. There’s a single table under the shade of a tree, surrounded by vineyards. Its pork taco, in particular, gets rave reviews. No drinks but there’s a small market right next door. Pacifico Restaurant. This bright, festive locale has a great vibe and features both fish tacos and crispy tacos. (Bonus: A wide array of margaritas.) 1237 Lincoln Avenue, Calistoga. Gott’s Roadside. (Napa and St. Helena). Not to go all gringo on you, but this upscale burger joint actually offers two great fish tacos – the Mahi-Mahi and the Ahi Poke Crispy Taco. Sit outside and enjoy with a glass of Napa Valley wine.